Retail sales jumped 1.4 percent in April, the strongest showing in six months, as consumers streamed back into auto showrooms and shopping malls, the Commerce Department reported Thursday. Last month's increase was far better than the 0.8 percent gain many analysts had been expecting and represented a significant rebound from the lackluster 0.4 percent increase in March. The spending surge was led by a 2.5 percent jump in auto sales. But the strength was widespread with clothing stores posting their best increase in 2½ years. The sales report was more evidence that a dip in economic activity in March was just temporary. In a second report, the number of U.S. workers filing new claims for unemployment benefits rose by 4,000 to 340,000 last week, the highest level for jobless claims in a month. The four-week moving average for claims also rose by 2,000 to 324,000. Even with the increases, the claims numbers remained at levels indicating the labor market was continuing to improve, analysts said. The 2.5 percent increase in auto sales in April followed a 0.8 percent rise in March and was the best showing since a 4.2 percent surge in December, a month when dealers offered attractive end-of-the-year incentives in an effort to clear out a backlog of unsold cars. But even excluding autos, consumer demand was strong last month, rising by 1.1 percent, far above the tiny 0.2 percent March increase in retail sales excluding autos. The strong April increase in retail sales came after a number of reports had given indications that the economy slowed significantly in March, raising worries that the country might be on the verge of another "soft patch" as a sharp jump in energy prices caused consumers and businesses to grow more cautious. However, the April jump in retail sales is evidence that the March slowdown was a temporary aberration and not the start of an extended period of weakness. The government reported last week that businesses hired a better-than-expected 274,000 workers last month. 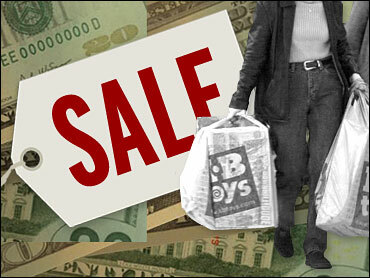 Analysts said with employment rising, consumers will be able to keep spending in the months ahead. Consumer spending is closely watched because it accounts for two-thirds of total economic activity. For April, sales at clothing stores rose 2.8 percent after having fallen by 2.2 percent in March. It was the biggest increase since a 5.2 percent surge in October 2002. Sales at department stores rose 1.3 percent following a 2 percent decline in March. Also enjoying sales gains were hardware stores, up 1.2 percent, health care stores, up 0.7 percent, and gasoline service stations, up 1.9 percent, a gain that primarily reflected higher gasoline prices. Appliance and electronic stores saw a 0.1 percent drop in sales and sales were down 0.3 percent at sporting goods, hobby, book and music stores. Restaurants and bars saw a 0.9 percent increase in sales while grocery stores saw sales increase 0.6 percent.